This Summer, three Windward students will travel to France to study abroad as part of the CIEE Immersion Program. The trio—Gia Kokotakis '20, Bella Downey '21, and Emma Gargiulo '21—submitted personal essays to the program, and each were awarded merit scholarships. Bella and Emma both finished as top 10 finalists in the California Student of the Year Scholarship, and Gia secured a full ride. 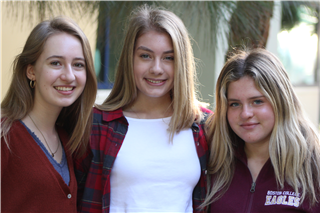 Taking classes and living with host families for four to five weeks, Emma (Paris) and Bella and Gia (Toulouse) will enjoy the highest level of language acquisition possible thanks to the program. Félicitations to our fantastic language students!